What do you say about a week that starts out with the Accidental Locavore’s appearance on Emeril’s Table, slides into a feast of local meat and matching cocktails, moves into a pizza tour of Brooklyn, stops for “breakfast” at the Chocolate Show and ends with Clown U for the Thanksgiving Parade? Toss in almost all the rest of the boroughs for fun and a couple of Broadway plays and it was a wild week! Since you all know about the Emeril show, let’s get started Monday night at City Winery for Meat With a Twist, the kick-off for Meat Week. Lots of great (local meat) nibbles, ranging from various sliders to pâtés and more. The Locavore favorites? Two lovely versions of steak tartare, but the best? 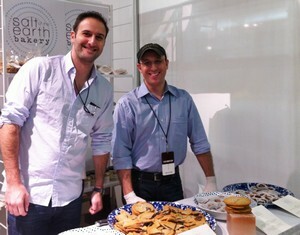 Amazing fois gras from Hudson Valley Fois Gras. The best cocktail? Blood orange vodka with lemon juice and simple syrup (lemonade to you and me). Later in the week, a fun bus tour, with a Slice of Brooklyn to explore that borough’s famous pizza. Because we were part of a shoot for an upcoming TV show, we only got to one stop on the tour, L&B Spumoni Gardens for their famous Sicilian style pizza. What makes theirs different is they put the cheese directly on the dough, then add tomato sauce. I missed the nice gooey cheese on top, but the pizza did taste good. Tony, who runs the tours, is a fun, knowledgeable guy who obviously loves what he’s doing! I’ve signed up for his tour of Christmas lights on December 3rd, want to come? Friday morning, a quick run-through of the annual Chocolate Show. The Locavore has learned (the hard way) to limit the amount of chocolate I eat. It’s awfully tempting to try everything in sight, but a little discretion goes a long way. 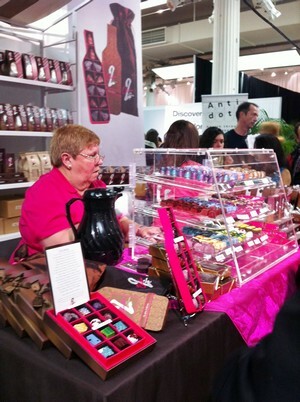 My friend, Elyissia, 2 Chicks With Chocolate, had a great booth, with lots of new treats, including jars of their amazing lemongrass caramel that you can take home (heat in microwave for 10 seconds and pour over ice cream…delicious!). I also met the two partners in Salt of the Earth Bakery who do incredible brownies, the must-have and aptly named, OMG, with caramel and fleur de sel… Warning — you’ll be hooked! 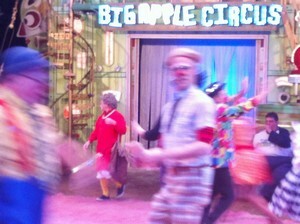 Saturday morning, a trip to the Big Apple Circus to get my clown training from Grandma and the other clowns for the Macy’s Thanksgiving Parade. This year I’m a birthday clown, towards the end of the parade, with Ronald McDonald. Confetti is rationed this year, anyone want to start a Twitter campaign… #moreconfetti? Special Thanksgiving Edition of the Boomers Blog Carnival!